Disability expert Anthony Tusler would like to see Apple keeps the needs of disabled consumers in mind when designing its products, according to a Macworld UK article. Mr. Tusler was quoted as saying: "A company like Apple, for example, puts little of its trademark flair and ingenuity into accessibility issues." He thinks the current generation of designers will understand the problems at hand "when they are exposed to usability ideas. I know they will discover that universal design is a puzzle to be solved that will help people with disabilities and the aging Baby Boomers." studies and consulting services for sustainable/responsible tourism. Continue reading Sustainability & Inclusion Goes Hand-in-Hand. A global, but cynical, business practice, approaching ubiquity in some parts of the United States, has met with good governance on the part of the Japanese government again placing the country in a leadership position regarding the increase in older travelers. The Yokohama Municipal Government has begun an investigaition of the hotel chain Toyoko Inn. The company confessed that some of its business hotels removed mandatory parking facilities for the disabled after inspectionscertified the sites as barrier-free. Such an action is a violation of Japanese city ordinances and national laws, including the Building Standard Law . Continue reading Disabled Parking Goes Up in Smoke. 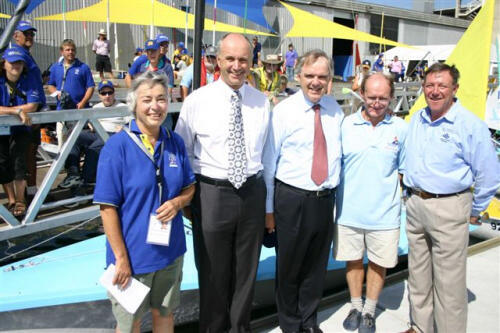 This morning, Federal Minister for Sport, Senator the Honourable Rod Kemp, officially launched a new Australian-designed yacht for the 2008 Paralympics and opened the largest regatta in Australia for sailors with disabilities. The ceremony was staged at Victoria Harbour in Melbourne Docklands, venue for the Melbourne Stopover for the Volvo Ocean Race. The boat, the SKUD18, has been selected by the International Association of Disabled Sailing (IFDS) as the craft for the new Two Person Sailing Competition at the 2008 Paralympic Games, taking Australian innovation and technology to the world. The SKUD18 (Skiff of Universal Design) is the latest design of accessible sailing dinghies from Access Sailing Systems Managing Director Chris Mitchell. Continue reading AccessDinghy Reveals SKUD18. Every Person with a Disability (PWD) has a right to live with dignity and grace. He also has the right to move out independently with least assistance. India is a land of vast magnitude and socio-economic, religious and cultural diversity. Disability knows no barriers as it concerns the problems and hardships to be faced in an inaccessible environment. And, it is our firm conviction that barrier-free tourism for PWDs can play a crucial role in integrating the PWDs into the mainstream of the society. Continue reading SAMARTHYA - Yatra with a Difference. Have ever wondered whether or not you need a visa or simply your passport to visit a country? Here is an online tool to help (in English, Spanish, and Italian). The Feria Internacional de Turismo will be held February 25 - 29 in Madrid and Polibea Turismo will be there! Yuquan Shi has published a study entitled, "The accessibility of Queensland visitor information centres' websites"
The Ministry of Transport is expected to promulgate a regulation on adapting public transport for disabled people soon. To gather opinions from groups of Disabled people, social organisations, relevant ministries and sectors before drafting a regulation, a seminar co-organised by the National Co-ordinating Council on Disability of Viet Nam (NCCD) and Viet Nam Assistance for the Handicapped (VNAH) was held in Ha Noi. Nguyen Huu Tho, director of the Department of Roads at the Ministry of Transport (MoT), who is leader of the team in charge of creating the new regulation, said it would involve adapting buses and bus stops, and providing specialised routes for the disabled. "There are 5.1 million PWDs in the country and until now there hasn't been any official regulation on the public transport system that gives priority to them," he said. Continue reading Trang web cá cược trực tuyếnPublic Transit Access in Vietnam. It’s noon on an overcast Monday, and a handful of customers sip coffee and tea as they tap away at their iMacs, while on the other side of the cavernous room, several people haul in materials for a new art exhibit. The Attic, which sits above the Blue Lagoon nightclub, is a blend of three of Quigg’s interests—real estate, accessibility and art. The Attic has already made a significant contribution to the growing art scene in Santa Cruz. But, if Quigg is as successful with his planned housing projects as he is with The Attic, and, if they are built at the same pace that they are being planned, his efforts could have a decent impact on affordable housing in Santa Cruz, and a significant one for the disabled community. Continue reading Pioneer in the Practice of Inclusive Destination Development. Mission ‘Marsimik La’ – the highest vehicle mountain pass in the world. At 18,632 feet, it is 1,232 feet higher than the base camp of Everest, which is 17,400 feet. It is at a distance of nearly 1200 kms from New Delhi, the Indian capital. To reach it you have to cross 7 of the world’s highest vehicle mountain passes with broken or missing roads, streams flowing over the road, extremely steep climbs and sub zero temperatures. It was going to take me 55 hrs of near non-stop driving. Continue reading ‘Marsimik La’ – the highest vehicle mountain pass in the world. In Paris, the city of gastronomes, the concept has been embraced enthusiastically. The restaurant Dans le Noir is packed every night and the owners are opening a similar establishment in London. And despite the competition in the capital from Gordon Ramsay and Marco Pierre White and a string of celebrity chefs, they are confident of success because they are that little bit different. Continue reading Restaurateur Banks On Darkened Diner. I recently told a friend about CHLA's "We Welcome Service Animals." I mentoined that, once a hotel makes sure that it properly complies with the ADA mandate allowing people with disabilities to travel freely with their service animals it requires only a business decision to accommodate guests with pets. She shared with me the following marketing piece she received from W Hotels. They have made the leap. Continue reading Beyond Service Animals. Continue reading Dog That Prompted Change In Senate Rules Dies. WASHINGTON, DC--Here's good news for moviegoers who use wheelchairs. The U.S. Department of Justice announced Wednesday that it has settled a federal lawsuit with the country's largest movie theater chain, Regal Entertainment Group, to make the movie experience for wheelchair-users comparable to that of other viewers. Under the agreement, Regal's current and future stadium-style cinemas will provide improved lines of sight for such patrons by placing the wheelchair-accessible areas as close to the middle of the auditoriums as possible. Continue reading Largest Movie Chain Agrees To Rearrange Wheelchair Seating Areas. Napa Valley California Begins: Ubiquity of Universal Design? "I work in in-home support services, so I'm very aware of our needs as we get older," said Shiff, executive director of Napa County Public Authority In-home Support Services. "The unit was build using universal design principles for the elderly and disabled. When I move in someday, I want to be able get around even if I have a walker. It's built with easy accessibility, no steps, the floor material is smooth but with texture so it's non-skid, there's a step-in shower and the countertops are a few inches lower than normal. I have two close friends in wheelchairs and I used them as models to decide if they could maneuver in the cottage." Shiff used to live in the country, but the more she worked with the aging population, she realized that that she preferred the senior-friendly Napa downtown. "There are more possibilities for seniors in the city of Napa," said Shiff. "I can walk to the store, the Opera House or the bank and be connected with people rather than isolated." Continue reading Trang web cá cược trực tuyếnNapa Valley California Begins: Ubiquity of Universal Design?. MIAMI, FLORIDA--Rigoberto Alpizar became the first person killed by U.S. Air Marshals, after federal officers -- apparently believing he had a bomb and was a threat to fellow passengers -- opened fire as he tried to leave a plane at Miami International Airport. Authorities later determined that Alpizar, a U.S. citizen, was not dangerous. No explosives were found near him or on the jetliner. Continue reading Air Marshals Fatally Mistake Man With Bipolar Disorder For Terrorist. From Thailand, Topong Kulkhanchit, Regional Development Officer, provides the following timely news items. Continue reading Thailand Travel Scene. For those of you in the listening range of Capital Public Radio (KXJZ & KXPR) in Northern California, tune in to Insight at 2 PM on Friday January 13 to hear an interview with me. Actually my segment won’t come on till about 2:40 PM, but the whole program is worth a listen. I have to applaud Jeffrey Callison (the host of Insight) for covering disability issues on a fairly regular basis. Just last week he aired a segment called "Disabled in an Abled World;" an interesting interview with Doug Champa, a Sacramento paraplegic. Doug talked about his life, and about his struggle to redefine himself post-injury. I actually listen to Insight on a regular basis, so it’s nice to be interviewed by a host that I really like. And yes, I am doing a live radio interview on Friday the 13th! Continue reading NYC Parks & Accessibility. EDINBURGH, SCOTLAND--Scotland's Disability Rights Commission is actively pursuing legal action against pubs, restaurants, shops and health clubs that have not removed access barriers to people with disabilities. According to a story in Wednesday's The Scotsman, the DRC claims that many retail and leisure businesses have failed to comply with accessibility requirements in the United Kingdom's 1995 Disability Discrimination Act, the most recent of which came into affect in October 2004. Continue reading Scotish Rights Commission: Businesses Continue To Fail On Access. Continue reading Universal Design Accessorizes!. Accessology, Inc. is the work of Kristi J. Thomas. Evolving through projects arising from compliance to regulation rather than Universal Design, the 15 year old enterprise has plans to open a training center in a new development by the Blackard Group of McKinney, TX known as Adriatica Available public information does not explain whether the Blackard Group development, Adriatica, is to be a Visitable community envisioned through Universal Design's human centered approach or whether it will reflect the minimalist strategy of compliance. I was researching a blogging tool, Nucleus, for a new project when I stumbled across The Tourism & Hospitality and Diaries. It is written fo students in the field and does not specifically address universal design but is a helpful resource on trends and studies. The Review of Disability Studies Journal has issued a call for papers on the theme "Parting the Waters: Disability and Deliverance in the Wake of Disaster." Deadline for submissions is January 14. Continue reading Review of Disability Studies. A brief paraphrase of the press release below in Portuguese is that the Othon network of hotels in Rio de Janeiro has launched an intiative to hire 12 hospitality professionals with disabilities. This will bring the total number of employees with disabilities in the 8 Othon hotels in Rio to 42. My confidence in a hotel, or airline, always goes up when I see "someone like me" reflected in the staff. I do not recall meeting employees with disabilities in my last stay in an Othon in Rio. Parabems Rede Othon! And parabems to those lucky candidates who land the new jobs!! Continue reading Inclusion Behind the Front Desk at Othon Hotels in Rio de Janeiro. In order to better serve travelers with disabilities, Microtel Inns & Suites, the all-newly constructed, interior corridor chain of budget/economy hotels, now provides ‘Access Microtel’ pamphlets, ‘Accessible Fitness’ bags and Upper Body Ergometers for guests with special needs. The Access Microtel guide offers specific information – both in large print and in Braille – about the accessibility features available at Microtel hotels. Accessible Fitness bags include three-pound hand weights, two types of stretch bands and a pair of handgrips. They are located in every Microtel hotel with a fitness center on-site, and are also available for guests to check-out and use in their room. The Upper Body Ergometer is a piece of equipment that offers travelers with disabilities a variety of options for upper body cardiovascular conditioning to complement their daily work-out. It is available at all new Microtel hotels with a fitness center. Continue reading Access Microtel & New Ergonomic Fitness Centers. Okemos, Michigan - November 3, 2005 - In conjunction with World Usability Day, Human Factors International (HFI), TechSmith Corp., and Michigan State University today announced the findings of their usability study of online travel sites, which indicates that Internet users prefer to book travel on Orbitz.com rather than auction site Priceline.com or airline site Southwest.com. The theme of World Usability Day 2005 is "Making it easy!" Based on the results of this study, Orbitz was best able to achieve that goal. Continue reading Usability Study Indicates Internet Users Prefer to Book Travel with Full-Service Travel Site. Continue reading A Multilingual Lexicon. Continue reading New Accessibility Standards Adopted for US Federal Facilities. Is Universal Design at Home the "Boomer Blind Spot?" Baby boomers planning an active, independent retirement need to consider bathrooms and bus stops as well as stocks, bonds and health care plans, researchers at the University of Arkansas say. A recent survey funded by the Universal Design Project, an outreach program of the UA School of Architecture, shows that the next generation of retirees is overlooking a key factor to aging -- housing. Arkansas leads the nation in poverty, aging and disability statistics, making it a window into the nation's future. The survey, conducted through randomly selected phone interviews with 600 Arkansas households last May, found that an overwhelming 95 percent of boomers (those born between 1943 and 1963) believe that they will maintain an independent lifestyle, although 81 percent acknowledge that their health will decline as they age. Only half believed that neighborhood design would impact their lifestyle, and one in four dismissed the importance of home design on their ability to live independently. "With all of the media's focus on health care and retirement, there appears to be a lack of awareness about housing and neighborhood design for older adults," said Kory Smith, an architecture professor who directs the Universal Design Project. Continue reading Is Universal Design at Home the "Boomer Blind Spot?". Douglas Bowman doesn't write about Universal Design. He is, in fact, a very successful visual designer specializing in simple, standards based, online design. So it was poignant to read his account of an encounter with a blind user who appreciates his though and work. Read A Different Gravity.